The diaphragm serves either as a barrier between two chambers, moving slightly up into one chamber or down into the other by relying on pressure differences. It is also used as a device that vibrates when certain frequencies are applied to it. This is also used instead of a stem washer. 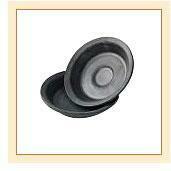 It is a kind of cap, round in shape and is found on compression faucets. There are fabric-reinforced diaphragms utilizing a layer of an engineered fabric material. This is considered as a part of the diaphragm construction. This layer of fabric give tremendous flexibility inn design. A very thin-walled diaphragm can withstand high pressures while at the same time remaining very flexible and responsive to minor pressure variations. The fabric reinforce diaphragm is made of various fabrics like polyester, nylon and silk. In other words, a diaphragm is a flexible membrane with low permeability to fluids and gas. It will permit relative motion between a stationary and a moving member and maintains a separation of the two media on either side. In many applications the diaphragm also maintain a pressure differential between the two media. When installed in the flange of an instrument, the rubber diaphragm serves as its own gasket, resulting in a fluid tight seal.